Diageo is relaunching its Mortlach range of single malts, and reintroducing a 16-year-old expression, after admitting its previous range ‘disappointed’ whisky fans. The Scotch producer had introduced a high-end range of no-age-statement malts in 50cl bottles for its Speyside distillery in 2014, withdrawing the 16-year-old expression that existed as part of Diageo’s Flora and Fauna range. The range drew criticism from whisky fans who ‘weren’t happy about the smaller bottle sizes, and the prices that went with those bottle sizes as well’. 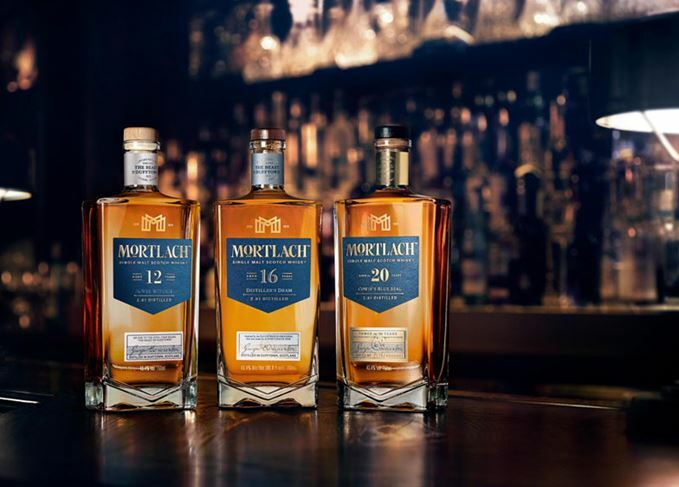 Now Diageo has reimagined its Mortlach offering, discontinuing the previous range and introducing four new expressions, including a 16-year-old. Rich Walker, global head of whisky marketing at Diageo, said: ‘When we launched Mortlach in 2014 we were looking to create a new category. However, we heard from many people we respect and admire that when it came to price and pack we got it wrong. Mortlach’s previous range was comprised of Rare Old (£55), Mortlach 18 Year Old (£180), Mortlach 25 Year Old (£600) and the travel retail exclusive Special Strength (£75). The ornate bottles were inspired by the Victorian industrial era in tribute to George Cowie, a Scottish civil engineer who built Mortlach as the first distillery in Dufftown in 1823. The new range is comprised of three core range expressions – a 12-, 16- and 20-year-old release – as well as a 14-year-old which will be a travel retail exclusive. All four expressions have been bottled at 43.4% abv – the original bottling strength of Mortlach in the early 1900s – and presented in the same bottle as Mortlach Rare Old. Mortlach ‘Wee Witchie’ 12 Year Old is a ‘meaty, sulphury’ expression matured in American and European oak ex-Bourbon and Sherry casks to ‘showcase Mortlach’s distillery character’. Described as having notes of chocolate, marmalade and tobacco, it will be available for £50 for a 70cl bottle. Mortlach ‘Distiller’s Dram’ 16 Year Old has been matured in a mixture of refill and first-fill American and European oak Sherry casks, and is described as ‘more balanced than the Flora and Fauna 16 Year Old’. The expression will be available for around £80 for a 70cl bottle. Mortlach ‘Cowie’s Blue Seal’ 20 Year Old is named after one of the original bottlings of Mortlach dating back to 1909, which was also the inspiration for the new range’s design. Matured exclusively in American oak ex-Sherry casks, with a percentage of refill wood, the expression has waxy notes of overripe fruit, wood spice and oak. The expression will be available for £200 for a 70cl bottle. Finally, Mortlach Alexander’s Way 14 Year Old, named after former distillery owner Alexander Cowie, will be released as a global travel retail exclusive. Mortlach distillery is unique in that it distils its spirit 2.81 times, a complicated process known as ‘The Way’. Mark Brunton, Mortlach distillery manager, added: ‘We worked with our colleagues in maturation to create a diverse range with each at its heart still reflecting the bold distillery flavour. The new range will be released across Europe, Southeast Asia, Taiwan and the US this autumn. Dissecting Mortlach: the Whisky Prof explains the facts behind a spirit distilled 2.81 times. The single malt, distilled in 1938 and bottled in 1999, will be auctioned next week. Only 94 bottles of the oldest whisky from the ‘Beast of Dufftown’ have been released. Whisky innovation doesn’t necessitate radical changes, writes Dave Broom. A 75-year-old Mortlach raises questions of perceived identity, character and the passage of time.